Tyler Cowen links today to a new paper that, at first glance, comes to an unsurprising conclusion: the longer you’ve been out of work, the less likely you are to get a job interview. Employers generally figure there’s a reason that someone has been out of work for a long time, so resumes and job applications with long jobless spells usually get tossed aside. This is, obviously, especially bad news during a recession, when lots of people have long periods of unemployment through no fault of their own. But if you look a little closer, the study (here) has a bit of a silver lining. It turns out that when the economy is in good shape, employers do indeed discriminate against job applicants who have been out of work for a while. 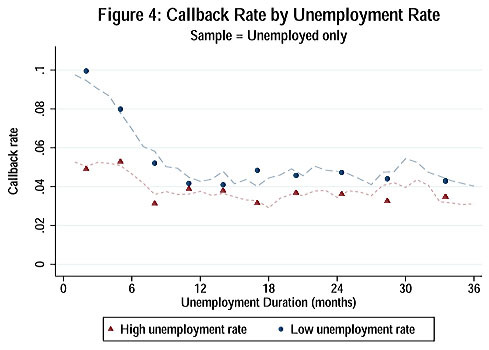 That’s the blue line in the chart below, which shows that applicants initially get callbacks about 10% of the time, dropping sharply to only 4% of the time after they’ve been unemployed for eight months. But take a look at the red line. That’s the callback rate when the economy is bad. The overall callback rate is lower, as you’d expect, but it also doesn’t go down as sharply. It starts out a bit above 5% and then declines to a bit below 4%. That’s still a drop, but not a huge drop. Apparently, when the economy is bad employers really do cut some slack for people who have been out of work for a while. I’m actually a little surprised by this, but it certainly makes sense. On the other hand, if you’ve been out of work for a year, the state of the economy hardly matters anymore. It’s just really hard to get anyone to give you a chance.